For years, ICTJ has championed the media and the role it plays in supporting truth-seeking and advancing accountability and redress for victims of conflict-related atrocities. In the places where we work, from South Africa, to the Gambia, Guatemala, Colombia and the Philippines, media projects and coverage—both mainstream and alternative—have been crucial in ensuring participation, mediating public discourse, contributing to acknowledgment for victims, and revealing long-hidden truths about crimes. In this era of political attacks on the independent media, the role of media in supporting transitional justice efforts, presenting unheard voices, and offering unfiltered historical records may be more critical than ever before. Still, there are often tensions in the relationship between journalists, advocates, and victims. When needed, ICTJ has challenged the media to resist the politicization of narratives and uphold victims’ rights and dignity, and it works to build the media’s capacity and raise its awareness about transitional justice issues in post-conflict settings and emerging democracies around the world. This month, we share a dispatch from our work in Uganda. In the late 1980s, the The Lord’s Resistance Army (LRA) launched a prolonged insurgency in northern Uganda. Throughout the conflict, both the LRA and the Ugandan military have been implicated in human rights violations, including killings, sexual violence, and widespread kidnappings. The LRA, in particular, gained notoriety for its extensive use of child soldiers. While the fighting has ebbed in the last decade, northern Uganda still bears the scars of this horrific conflict. 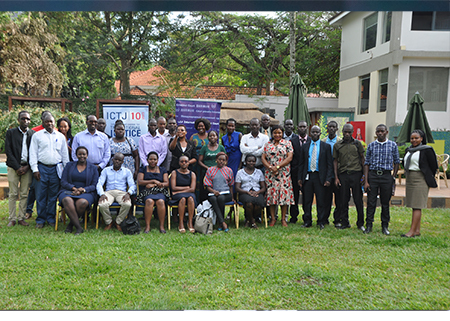 To help Ugandan journalists play a more constructive role in their country’s transitional justice effort, ICTJ, in partnership with the ICC Public Affairs Office, organised a workshop for members of Uganda’s media last February. Over two days, journalists explored their role in advancing accountability for international crimes and justice for victims of past atrocities, helped improve their capacity to report accurately and objectively on transitional justice, and discussed how to better promote the effective participation of victims and the public. Through the training, journalists learned about transitional justice and their influence on public discourse regarding accountability for mass atrocities. They also gained skills and insights on how to cover stories about victims in a sensitive and ethical manner, by taking into account the principle of doing no harm. At the end of the workshop, Bernard and other journalists pledged to support ongoing and proposed transitional justice processes by providing balanced, accurate, informed, and conflict-sensitive information to the public. Beyond building the capacity of journalists, ICTJ has worked for years to train and empower advocates and victims throughout its global programs. ICTJ continually assesses the role of the media in transitional justice processes, and conducts research on the subject to inform practitioners and stakeholders and help them to develop more effective media engagement strategies.